During the period between World War I and World War II, when Japan embarked on the reckless path of engaging in a series of wars starting with the Sino-Japanese War, liberal journalist Tanzan Ishibashi vocally objected to the nation taking such a path — by advocating the “small Japan” principle. 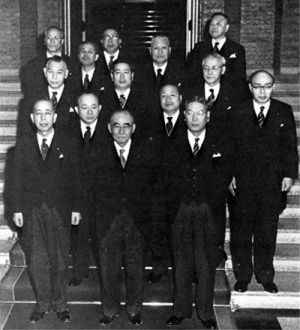 After World War II ended, Ishibashi turned himself into a conservative politician. After grappling with the nation’s postwar reconstruction as finance minister in the first Cabinet of Prime Minister Shigeru Yoshida, Ishibashi was appointed the first prime minister following the 1955 establishment of the Liberal Democratic Party through the union of main conservative forces. However, he succumbed to illness and his administration ended in just 65 days on Feb. 25, 1957. It was Nobusuke Kishi, the grandfather of today’s Prime Minister Shinzo Abe, who took over from Ishibashi. In the years before World War II, Kishi, as a young career bureaucrat, pushed forward Japan’s policy in Manchuria, which earned him the charge of a Class-A war criminal after Japan’s defeat in the war. Ishibashi’s decision to retire from office over his illness was lauded at the time as a rational move that followed the proper behavior required in constitutional politics. 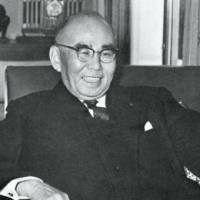 However, the shift in power from Ishibashi, who survived the prewar to postwar years as a liberalist, to Kishi, who was seeking a strategic revision to Japan’s security treaty with the United States, marked a transition between administrations of diametrically different guiding principles. 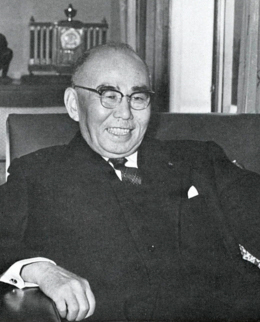 Through his lifetime, Ishibashi advocated liberal-oriented views on the platform of Toyo Keizai Shimpo, a business magazine of which he served as president over a long time from the prewar to postwar periods. However, few mass media outlets at the time clearly pointed out the significance of the political transition from the Ishibashi to the Kishi administrations. Lately, I had a chance to have a look at Ishibashi’s former residence in the Nakaochiai area of Shinjuku Ward, Tokyo. The residence, where Ishibashi spent much of his life as a politician after the war, witnessed various political dramas. The house is also a legacy of his personal daily life in which he struggled with his illnesses. What moved me were the piles of overseas books, which filled up the not-so-large archive at the residence. There were traces that Ishibashi had read most of the books, and among them was “The General Theory of Employment, Money and Interest” by John Maynard Keynes. Shozo Ishibashi, a great-grandson of Tanzan Ishibashi who serves as representative director of his memorial foundation, kindly explained two pieces of a memo that were found inside the book. The memo, as it turned out, was permission — handwritten by Keynes himself — addressed to Ishibashi allowing him to translate the work into Japanese. According to records, the first edition of “The General Theory” was translated and published by Toyo Keizai Shimposha in 1941. What’s surprising is that the memo was dated 1937. Since “The General Theory” was originally published in 1936, it means that Ishibashi had read Keynes’ work in its English edition, made the decision to translate it into Japanese and had obtained the permission to do that within just a year. Even by taking into account the extraordinary reach of the Keynes’ theory after the publication of “The General Theory,” the depth of Ishibashi’s knowledge and his ability of absorb new things is just amazing. Shozo Ishibashi told me of an interesting episode. His great-grandfather referred to the policy of generating effective demand — the core of Keynes’ “General Theory” — as the same as his own way of thinking but never considered it an idea of Keynes’ own creation. Looking back on the life of Ishibashi, I believe that the role played by the prewar Toyo Keizai Shimpo as a business news outlet, notably for its unwavering positions on such issues as the controversy surrounding the 1930 lifting of the gold export ban, is worth revisiting. Leaders and intellectuals in prewar Japan were unable to learn from the journalism of people linked to the business media such as Ishibashi and economist Kamekichi Takahashi. Rather, it is time to become worried about the economic bubbles created by the second stage of Abenomics. Instead of leaving the task of managing the nation’s economic and monetary policies in the hands of bureaucrats close to Abe’s circle, people should make their own choice for a new generation of human resources to discuss those policies. If Ishibashi had not fallen ill in 1956 — which forced him to hand over the administration to Kishi — how would Japan’s postwar history have evolved? Given that his health recovered later, he might have had the choice of keeping up his administration by hiding the illness. At least in terms of policies on national security, the administrations of Ishibashi and Kishi were far apart. The national movement opposing the 1960 revision of the Japan-U.S. security treaty, in which protesters daily encircled the Diet, may have taken a different course. 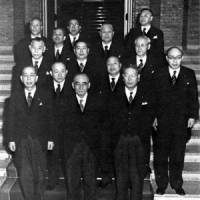 The handover of power from Ishibashi to Kishi was an extremely rare form of “choice of government” that was made possible by the aesthetic sense of Ishibashi, who cared so much about the principles of constitutional politics, and his liberal temperament. As a fellow economic journalist, I would like to pay respect to the insight of Ishibashi, who was a pragmatic realist throughout his career as journalist and as politician, and digested and applied Keynes’ theory to policies. What Japan should be revisiting today is not the legacy of Kishi, in whom Abe seems to hold blind faith, but the evaluation of the liberalist Tanzan Ishibashi. Kenji Nagano is a journalist who covered the securities industry for the Nikkei business newspaper and served as editor-in-chief of Nikkei Business magazine.